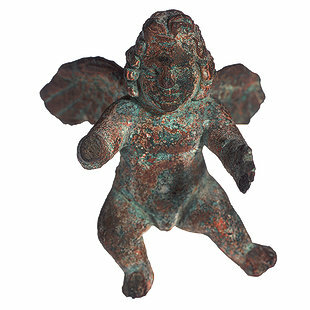 This small bronze statuette depicts an angel with wings, standing and lifting his arms forward. There are seven ranks of angels in the Coptic Church: Cherubim, Seraphim, Thrones, Principalities, Virtues, Powers, and Authorities. There are also seven Archangels. This statue represents one of the seven archangels. Copts greatly revere the Archangels, especially Michael, Raphael, and Gabriel.